MONUC DDRRR teams have redoubled efforts, working jointly with Congolese authorities to sensitise combatants on the DDRRR process, including those displaced in the Kivu provinces, the combatants of the Abacunguzi Fighting Forces (FOCA) and the armed wing of the FDLR and its splinter groups. The objective of this public awareness campaign is to explain to the FDLR combatants and other groups of the DDRRR process, which is underscored by the Official Nairobi Communiqué of 9 November 2007, Security Resolution 1794 of 27 December 2007 and the Goma Acts of Engagement of 23 January 2008, and which clearly stipulate that the presence of FDLR combatants in the Democratic Republic of Congo and their illegal activities will not be tolerated. Furthermore, if they want to avoid forced disarmament and repatriation, they must immediately surrender weapons peacefully and join the MONUC DDRRR process, in order to be voluntary repatriated with dignity to Rwanda, their country of origin. The public awareness campaign concentrated on the real social and economic opportunities open to those who surrender their weapons and choose voluntary repatriation and, once in Rwanda, profit from the National Demobilization and Reinsertion plan, supported by the MONUC and the multi country partners of the demobilization and reintegartion process (MDRP) of the World Bank. The distribution of booklets and the exhibition of testimonies of ex-combatants recently repatriated to Rwanda at sensitisation meetings to combatants encourages them to return. The number of combatants repatriated on a voluntary basis via the MONUC DDRRR process between January and mid-May 2008 rose 25% compared to the same period last year. This increase is mainly due to the new approach through the Nairobi Action plan, which envisages an increased combination of sensitisation efforts by the joint actions of MONUC DDRRR teams and Congolese authorities (to counter the pressure that the FDLR commanders exert on ordinary soldiers). The new approach also consists of reinforced political and diplomatic efforts, with increased collaboration between the Congolese and Rwandan governments, the support of the international community in the implementation of the plan, as well as military measures. The FARDC integrated battalions who received additional training from MONUC forces in Nyaleke, North Kivu, and in Luberizi, South Kivu, have been redeployed in both Kivus, in particular in the zones under the influence of Rwandan FDLR combatants and other dissenting factions. The FARDC integrated battalions have the role of gradually restoring state authority, and are supported logistically and tactically by MONUC blue helmets. Other objectives include ensuring the protection of civilians populations from exactions and curbing illicit economic activities of FDLR combatants and other armed groups. Since the launch of the MONUC DDRRR programme in 2002, some 6,000 Rwandan combatants have surrendered weapons and been repatriated to their country of origin on a voluntary basis, along with thousands of their dependents. 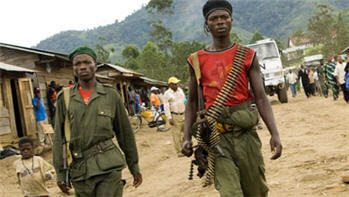 The estimated number of Rwandan Hutu FDLR combatants and rebels still present in eastern DRC is approximately 6,000, and in 2008, nearly 300 combatants were repatriated to Rwanda. The MONUC DDRRR voluntary repatriation to Rwanda on 21 May 2008 of FDLR Colonel Faustin Sebuhura, alias “Minani” and Sylvestre Mudacumura, a FOCA political advisor, is a notable development. MONUC is pleased that Faustin Sebuhura, who was captain of the Rwandan National police in Gikongoro, Southern Rwanda in 1994, chose to surrender peacefully and to voluntarily return to his country of origin, despite the serious charges against him. MONUC hopes that the decision of this important officer of the armed wing of the FDLR, active on Congolese soil, to voluntarily surrender weapons and return to Rwanda will be used as an example, to encourage the rapid disarmament and voluntary return of many other combatants.